PROVIDENCE, RI -- Noah Furman, Luke Pepin, and Mike Bermingham all had multi-point games for the Wizards in the 7-2 victory over the Knights. 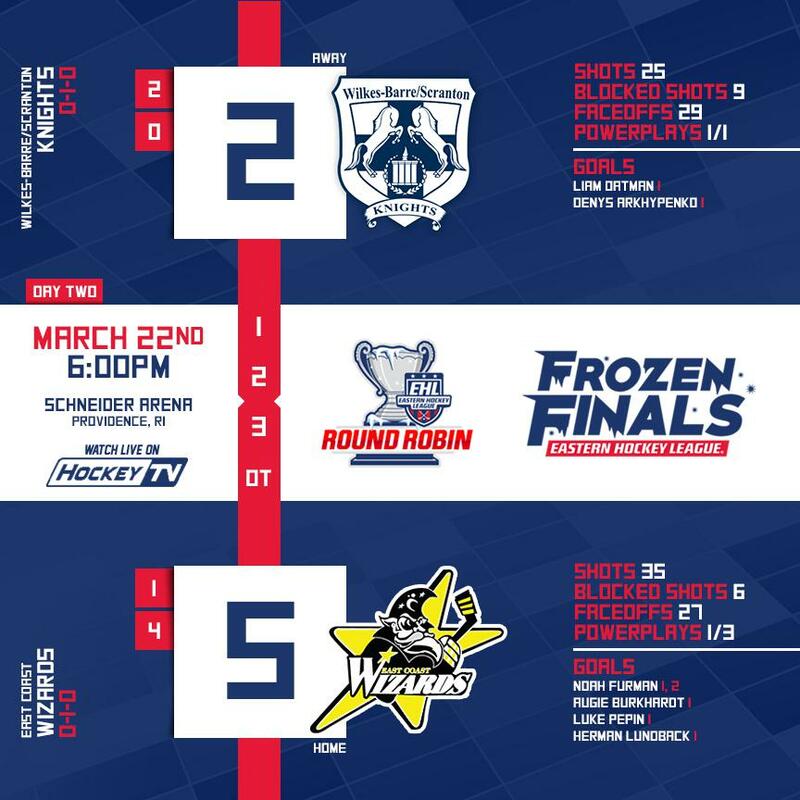 Below you'll find all of the goal recaps from the fourth game of the 2019 EHL Frozen Finals. Noah Furman got the Wizards on the board first at the 14:13 mark of the period thanks to a dish from Andrew Harley. Liam Oatman responded for the Knights at the 6:08 mark of the frame with a shot from the left hash that beat Lutz far post side. Emerson Emery had the lone assist on the goal. Denys Arkhypenko gave the Knights the 2-1 lead on the power play with 3:00 left on the clock with a one timer from the right side that beat Lutz five hole. Both Hunter Bersani and Matt Passaretti had the helpers on the goal. Noah Furman scored his second goal of the game at the 14:24 mark of the period by tipping a Mike Bermingham shot from the point. Andrew Harley collected his second assist of the game on the goal as well. Augie Burkhardt gave the Wizards the lead at the 6:55 mark by tipping a Luke Pepin shot between the legs of Walker through a heavy screen. Carter Elrod had the second assist on the power play goal. Just over a minute later, Pepin scored a highlight reel goal, weaving his way between multiple Knight’s defenders to give the Wizard the two goal advantage. With just 11 seconds left in the period, Herman Lundback collected a saucer pass from James Nash on a 2 on 1 and fired it by Walker to give the Wizards a 5-2 lead before the end of the frame. 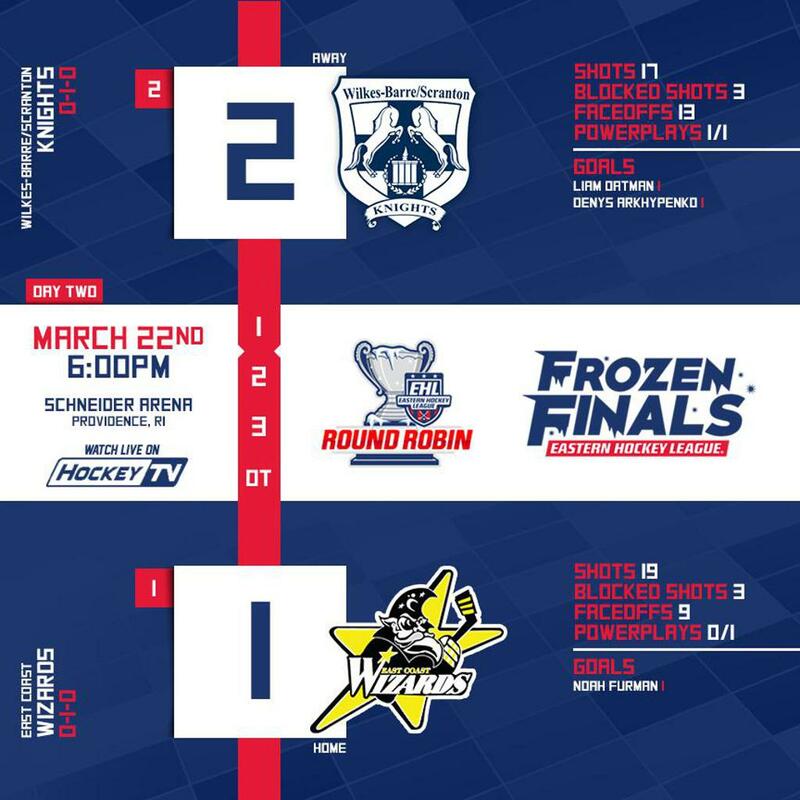 Harris Colvin gave the Wizards a 4 goal advantage at the 8:16 mark of the period on the power play thanks to a cross ice pass from Brendan Darby. Bermingham was credited with the second assist on the power play goal. Pepin gave the Wizards some late insurance with another power play goal at the 4:19 mark for his second goal of the contest.